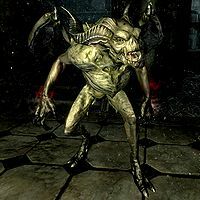 Gargoyles are creatures introduced by the Dawnguard official add-on. They have the abilities to absorb health with their claws, and are immune to both paralysis and poison. They have an additional ability: Resist Damage, 250pts. They drop various ores and gems when slain. When stationary, gargoyles disguise themselves as statues. They can often be found beside regular statues, helping them blend in. While posing as a statue, they are immune to harm and cannot be killed. 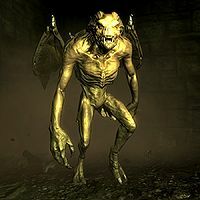 If they do not immediately burst from the rocks, magic (such as Soul Trap) can be used to distinguish a stationary gargoyle from a regular statue. 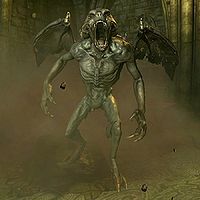 Occasionally you may encounter gargoyles in the wild or attacking cities, accompanied by vampires and death hounds. As a Vampire Lord, you may summon gargoyles to aid you in battle, much like a Conjuration spell. The power is only available through the Vampire Lord perk tree, by unlocking the Summon Gargoyle perk. Gargoyles start dropping the 3 × 25% gems when you are at level 2, and they start dropping the 1 × 75% ore when you are level 6. This page was last modified on 22 December 2018, at 14:22.